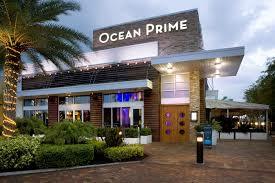 Ocean Prime is a modern, American restaurant and lounge serving extraordinary prime steaks & seafood. The menu offers additional dishes such as chicken, soups, salads, and a Raw Bar. Each dish is crafted with attention to detail and using only the finest ingredients. Ocean Prime also offers an award-winning wine list and signature cocktails. Nothing caps off a great meal like a decadent dessert. Check out the Ocean Prime Dessert menu. Check out the latest Ocean Prime menu with prices. Meeting for drinks after work just got easier. The Lounge at Ocean Prime is an ideal location. Each Ocean Prime site is uniquely designed to offer patrons stunning settings in an atmosphere that is social, fun, and glamorous. Beer, wine, cocktails and a select menu are available during Happy Hour. Being a member has its privileges. Join the V.I.Prime email club and get access to the latest news, special invitations, discount offers, and new dishes from Ocean Prime. Looking for that special gift? Give the A-Prime gift cards to family or friends. Ocean Prime can also accommodate your social or corporate meeting with private or semi private rooms. You can always follow or connect with Ocean Prime through various social media platforms. The goal of Ocean Prime is make your visit a remarkable dining experience by offering great tasting food, phenomenal table service, and genuine hospitality. To learn more about Ocean Prime, visit their official website.